Complex and compelling, this beautiful wine reveals savory aromatics of sage and bay leaf, combined with layers of intense cranberry, Bing cherry, sassafras and cedar. On the palate, velvety tannins set the framework for an elegantly structured and beautifully balanced wine, with layers of red fruit, Mission figs and minerality, as well as hints of cedar, white pepper and pipe tobacco that linger of the finish. My wife and I were in Napa Valley last weekend for a much needed break from children and work. We were told by a couple that Duckhorn Vineyards was a must. We stopped in without a reservation and sat up at the newly installed bar where Tony educated us about Duckhorn. Although the tasting was for four or five wines, they let us try a lot more. My wife loves the Merlot, as I did too. (My wife is not a Merlot drinker.) yet we both fell in love with The Discussion. We couldn't get over how smooth this blend was and can't wait to by a few bottle to share with family and friends. Duckhorn Vineyards rated the highest in our book over the dozen other wineries we visited. 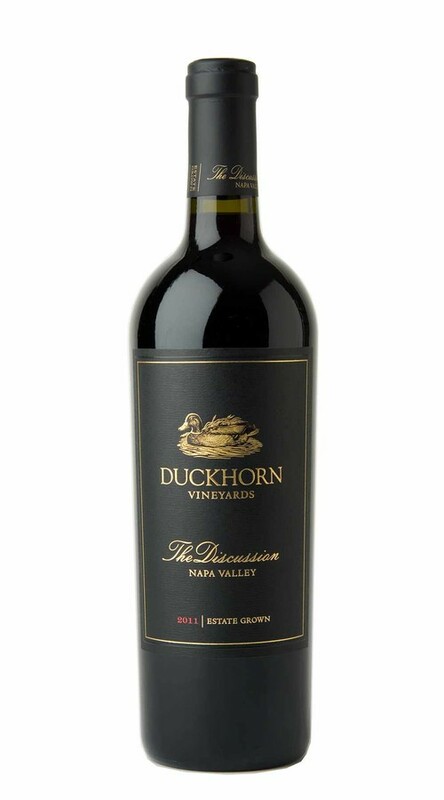 At Duckhorn Vineyards today, aromatic nose of mocha chocolate, licorice, plum, black cherry, and fig, more of the same on the palate, elegant, complex, has improved dramatically the last six months, big body, should improve more the next three years, rich fruit on the mid palate, long , flavorful finish and aftertaste. Bought two bottles, now have four bottles in the cellar. Big and balanced with several earthy notes, full of natural flavors, a hint of wood, smoke and minerals... Lovely accomplishment!